Pediakid 10M-Probiotics 10 Sachets is a food supplement with lactic ferments, fibers of inuline of chicory and bio-available zinc to rebalance the intestinal flora and participate to the growth of bacteria for the intestine. This food supplement has been elaborated with a basis of lactic ferments rigorously selected for their stability and benefits. It has a special packaging studied to guaranty the stability of its 10 billions of ferments, without need store them in the cold. 1 sachet per day, preferably morning or evening before meals, diluted in a glass of water. 10 days program. Can be suitable for adults over 15. 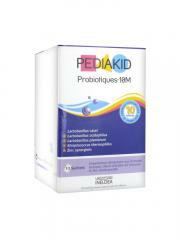 Indication: Balance the intestinal flora. Inuline de Chicorée, Agent de Charge : Maltodextrine, Ferments Lactiques : Lactobacillus Casei, Lactobacillus Acidophillus, Lactobacillus Plantarum, Streptococcus Thermophilus, Anti-Agglomérant : Silice, bisglycinate de Zinc.